Little Dutchie (aka Dutchess) is doing great. She is a real cutie! I call her my girly girl! She loves to hide under the covers in the morning, hoping to avoid getting up. When I come home in the evening she dances all around, we go outside and she can’t wait to come in jump up on the couch and get her belly rubdown. I am so happy I found her. 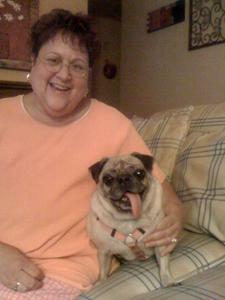 I thank you for all your hard work in pug rescue and helping bring the two of us together. Dutchie has a home for life and I just love having her around. Bunches and Bunches of Thanks!! !